The adaptation and reorientation to a more nimble, flexible workplace is best described with the phrase—HR Agility. 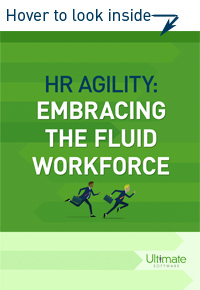 Adapting to a fluid workforce dynamic means becoming more agile to meet challenges head on. This modification won’t be easy, and the process will likely affect every area of human resources, payroll, and talent management. The rewards, however, are great: your brand will be associated with the future of the workforce, you will become an employer of choice, you will engage current employees, and you will continue to attract and retain top talent. So, why not take full advantage of a wealth of new technologies that can make life better for your people? The human resources department has the power to embrace HR Agility, innovating whenever possible and adopting technologies that can simplify the work lives of employees. In fact, 84% of HR professionals agree that their companies need to adapt their human resources practices to the expectations of new generations in the workforce. The debate surrounding whether this falls under the jurisdiction of HR is over. The only question that remains is: which companies will adapt first, and embrace the fluid workforce? Please fill out this brief form to begin embracing the fluid workforce.